Under US Copyright Law, once a tune is recorded and released, others may record and release their own versions without explicit permission from the writers or the publisher. The process is simple: pay for a compulsory license. The rate is preset by statute. 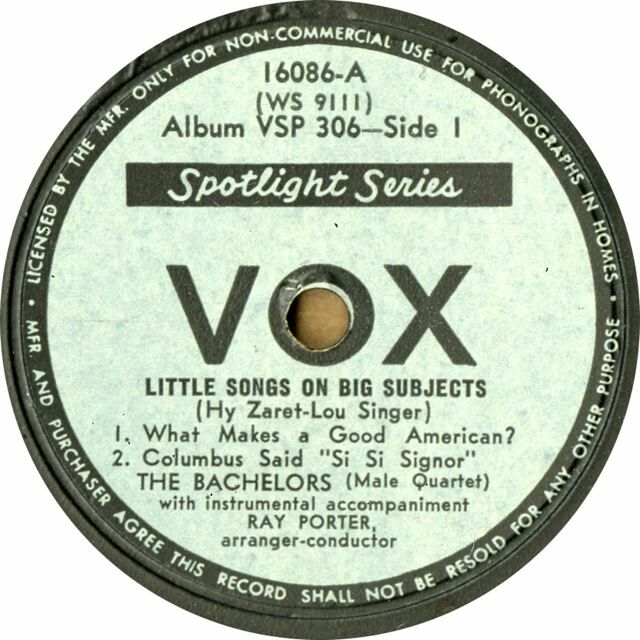 I recently learned that in addition to the Jesters’ very successful 1948 album, Little Songs on Big Subjects (described by me here and here), there was an almost identical album released on Vox Records by the Bachelors. I have not yet determined which album came out first. 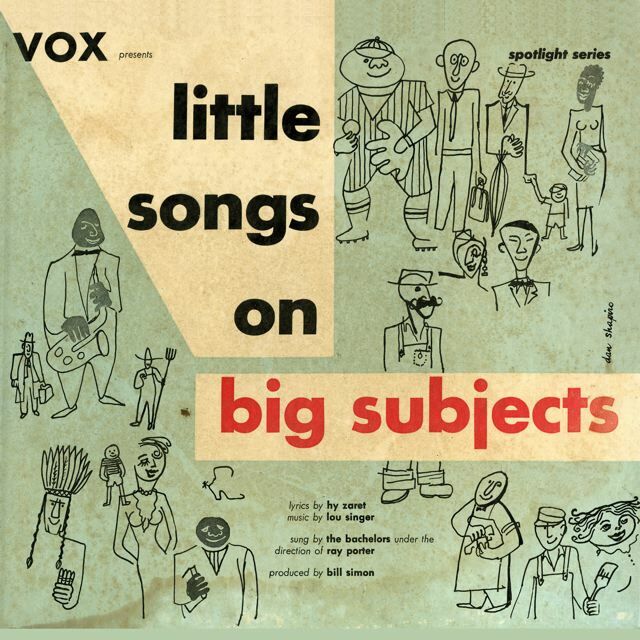 The Bachelors album was also entitled Little Songs on Big Subjects and included all the songs on the Jesters’ album, plus one additional Zaret/Singer tune, The Poor Old World (see below for the lyrics). Other than that one tune, the lyrics are the same on both albums; the arrangements are quite different. I had never heard any of the Bachelors’ versions. There is nothing about them on the Internet. Please comment if their arrangements are the ones you remember. © 1947 Argosy Music Corp. 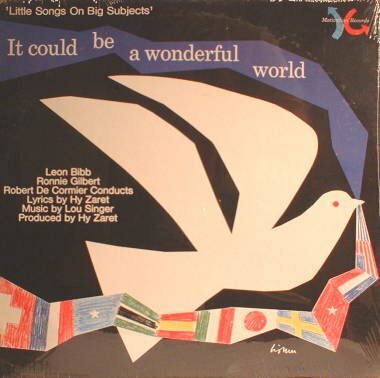 There was also a Leon Bibb/Ronnie Gilbert album called It Could Be a Wonderful World that included many (or all…I have more research to do) of these Zaret/Singer tunes. Subtitled Little Songs on Big Subjects (look at the album cover’s upper left corner), it was released in the ’50s, but it is barely mentioned on the Internet. 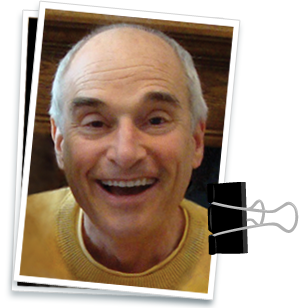 Written by Steve Cotler on February 22, 2010 at 10:47 pm and filed under Music. The UN (I think UNESCO) issued a book of piano music for the original album. I have a songbook. It was published in 1947 by Argosy Music (Hy Zaret’s ASCAP affiliate). I don’t know anything about a UN version. No sure what prompted my internet search for the album but I found your link to the Jesters and this one. I downloaded the Jesters album but knew it was the wrong one for me. I have one double-sided 78 rpm with 4 songs and the original Bachelors album cover shown above. Sadly I can’t find the Bachelors album to download but at least I have the songs, thanks to your earlier post. I also recall this album, and I am trying to locate a song, possibly from this or a similar record. The song entailed blood types and I thought the line “it is good to be me but I also see, its just as good to be you” Does anyone know the title of that song, or anything else about it? The song you are looking for is “I’m Proud to Be Me.” It is on this album and has been recorded by several others as well. I even put it on my children’s album. Thanks! now I can sleep. I downloaded the album, but only played a few of the songs, and missed that one! The Leon Bibb album is the one of my childhood. Somewhere packed away in a box is a fairly wrecked version of the album with the cover. It could be a wonderful world–Leon Bibb’s version is the one that is still in my head over 40 years since I played that record obsessively. Cannot find a copy of it no matter how hard I try. Sad. You have just made not only my evening but my weekend, month, and oh heck the next decade. Thank you so much for sharing! You can now listen to all of the Jesters’ and Bachelors’ recordings of these songs, and read some of their history, on our web site.